Corpse Party: Sweet Sachiko’s Hysteric Birthday Bash is a unique visual novel adventure game developed by MAGES Inc. Vengeful spirit Sachiko Shinozaki is having a birthday bash, and the lovable cast of damned souls from the Corpse Party series is invited. Join the revelers as they do their best to keep Sachiko happy and survive her twisted games. Join Sachiko and the lovable cast of damned souls as they take the very concept of genre and toss it aside. Prepare to experience terror, discomfort, joviality, and confusion in equal measure as Heavenly Host Elementary plays less-than-heavenly host to cooking contests, co-ed mixers, interpretive stage drama, traditional party games, and Lovecraftian horrors alike. Your decisions determine which of the game’s endings is attained, with only one true ending from each chapter leading into the next. Surviving to the end will require thinking like Sachiko and making the choices that will please her the most with the fewest casualties. If you get stuck in the game, check out the video walkthrough and gameplay for the game. 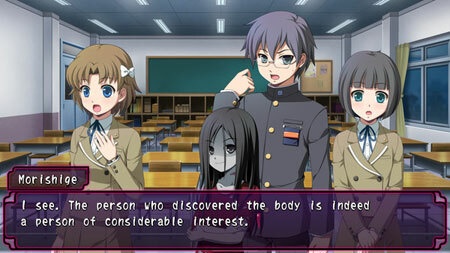 This entry was posted in PC Games, Walkthrough and tagged Corpse Party: Sweet Sachiko's Hysteric Birthday Bash Cheats, Corpse Party: Sweet Sachiko's Hysteric Birthday Bash Gameplay, Corpse Party: Sweet Sachiko's Hysteric Birthday Bash Guide, Corpse Party: Sweet Sachiko's Hysteric Birthday Bash Strategy, Corpse Party: Sweet Sachiko's Hysteric Birthday Bash Walkthrough by Marvin. Bookmark the permalink.